This is Seymour. He came to us as a stray about a year ago. 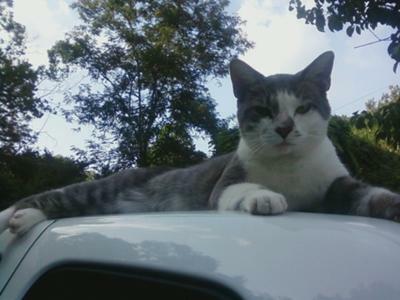 This big boy has made quite an impact on our hearts and he's the only one of our cats that thinks he owns the vehicles. As soon as one of us gets home, Seymour jumps on and is ready for a nap. We keep our car in the garage and our cat either sleeps on the roof or sometimes my husband leaves the window partly open and Felix jumps in and sleeps in the back seat. They sure like to sleep in some strange places. I think this could be his way of asking if you need a chauffeur. LOL Kurt, I think he was just upset with me. I started taking the pictures while he was asleep and got him in several different poses before I got one I really like. He was just over the camera and mamma in his face. Thanks for sharing, Angi. He has such an intense look! He looks very serious about his car naps. Perhaps he's trying to hypnotize you into transferring ownership of the vehicle to him.